Black garlic is a real delicacy, highly appreciated for its excellent antioxidant and nutritional properties, and the mild flavor and aroma it has. Apart from having a greater amount of antioxidants than ordinary garlic, it also exceeds it in medicinal and nutritional properties. This garlic is widely used in Asian cuisine and has been expanding to Europe for some years now. Black garlic also strengthens our immune system so it keeps us away from colds and microorganisms harmful to health. Its consumption is recommended for the winter months and in each seasonal change, although that does not mean that it can be consumed throughout the year. Although there are many areas in Spain of garlic cultivation, Las Pedroñeras in Cuenca (Spain), is known for the high quality of the garlic that comes from there. Therefore, if we look for quality black garlic, it is recommended that its origin be from Las Pedroñeras. – It has a greater amount of minerals and vitamins than, for example, cow’s cheese. – it is a main source of calcium, a fundamental mineral for our bones and our teeth. – Being rich in fat is very nutritious, so it gives us energy and proteins, very important for our muscles. – Contains vitamins of group A, vitamin E and D, and in greater quantity vitamins of group B. – Whenever the cheese is made with pasteurized milk, it is recommended for pregnant women, since it contains a large amount of folic acid. – In addition, it contains enough amino acids for the body to function perfectly. The fusión: Sheep Cheese with Black Garlic. From the fusion of two so natural and beneficial products is born the sheep’s cheese with black garlic of which we speak today. This is a pressed cheese made with pasteurized sheep’s milk and perfectly combined with real black garlic from Las Pedroñeras. It is available in 2 different cures, semi-cured, with a maturation of approximately 3 months, and cured, with an approximate maturation of 6 months. Its texture is compact and very balanced. 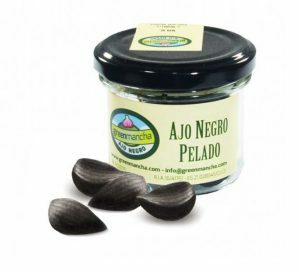 In the mouth, it leaves an exquisite and intense flavor, more intense the more it is cured, persistent but very pleasant, with a soft aftertaste of black garlic that contains its paste. It has all the aroma and flavor of the authentic cured cheese of yesteryear together with the exquisiteness of black garlic. An artisan cheese that will delight the most demanding palates. This large cheese with black garlic comes from Cuenca, historically a cheese-making town located in the heart of La Mancha. Here, a small craft factory is dedicated to the development of unique cheeses, among which the sheep’s cheese with black garlic stands out. In the world in which we live dominated by industrial cheeses, there are still cracks in the manufacture of such a special cheese. Spanish cheeses are a good choice at any time. Spanish Cheese is art. Here we show you a wide variety of the best Spanish cheeses.